This is a series of posts aimed at the beginning winter rider. More seasoned riders may also pick up a few tips along the way. It contains tips and strategies for staying safe and warm when enjoying the outdoors during the most beautiful season…winter. Zippers? What, do they make special zippers for winter cycling? Well no, not exactly. Typical heavy duty YKK zipper found on many top brand name outerwear products. This is your typical zipper. It’s a very good zipper. Feels solid in your fingers. Durable, won’t break under the roughest yanking and pulling. Easy to grab with your bare hand……ah…..we’re talking winter riding here. There’s no bare hands. Chances are you have a glove, or maybe even two pairs of gloves, or a mitten. Thus making it much harder to grab that zipper. Have you ever been riding along in the winter and wanted to open your jacket a bit to help vent some air so you don’t overheat. You might have learned how much more difficult it is to grab that zipper with a gloved hand. This is what zipper pulls are for. You may already have zipper pulls on some of your outerwear. 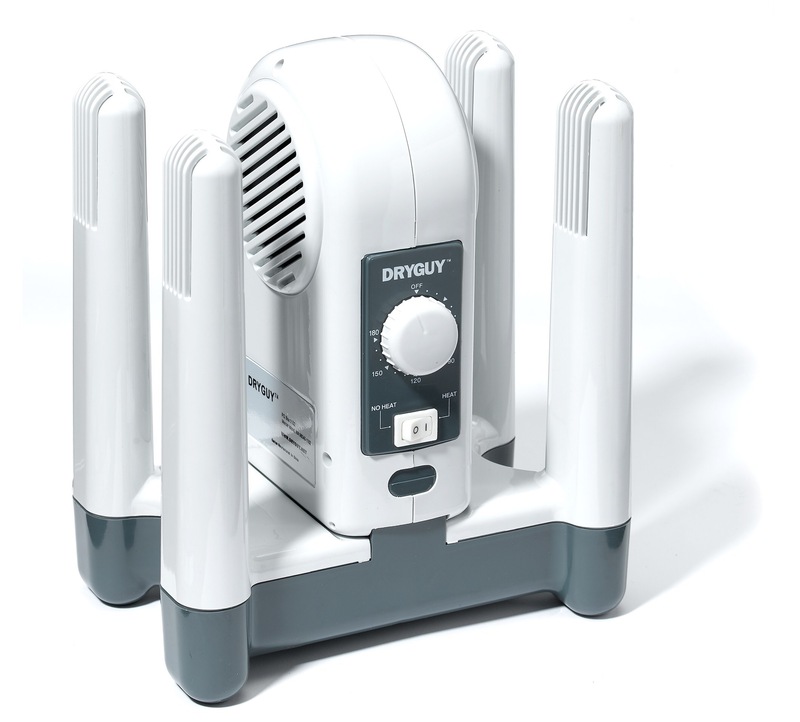 Lots of brands already include them with new products. The zipper pull makes it much easier to find and adjust your zipper, or open and close it, with a gloved hand. Some clothing may not have them or only have them on the main zipper. I always have extra zipper pulls laying around. I add them to zippers on pockets, zippers on bags, zippers on framebags….you name it. Anything I might want to open or close with a gloved hand gets a zipper pull. I buy small packs of zipper pulls at outdoor stores like REI. A pack of three or four costs a few dollars. If you search for “zipper pull” you’ll find zipper pulls in every size and shape. Zipper pulls I added to one of my favorite pieces of outerwear. Why is this important? It’s part of staying warm. Anytime you expose skin to the cold air, you lose heat. For many people keeping their hands warm is one of the biggest challenges of winter riding. Zipper pulls allow you to do things without having to lose precious heat by removing your glove. Good while it lasted, and weekend report. View from the Piedmont trails. Winter came on with a blast just before this past weekend. Bitter cold with a few dustings of snow. People think I’m crazy because I get excited about the bitter cold. 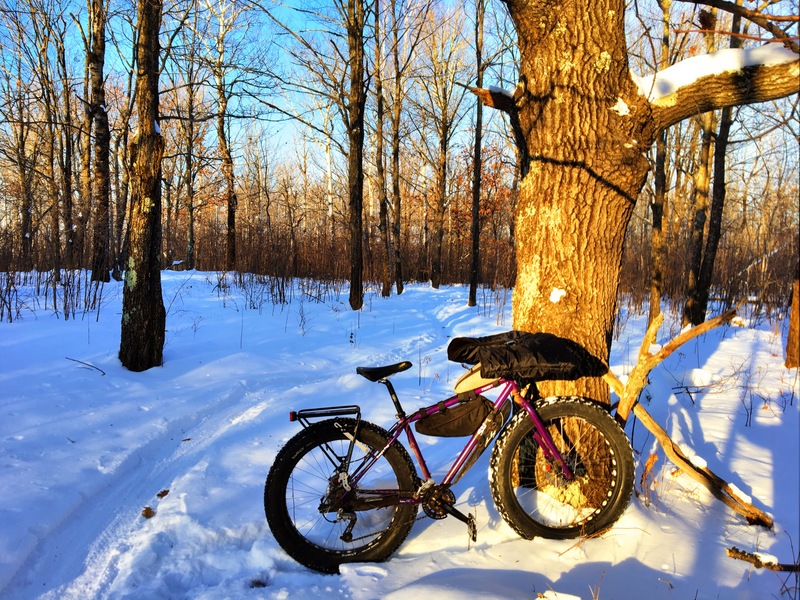 As an avid winter fatbike rider with over a decade of experience riding winter trails, I know what a good Arctic blast of cold air can do to firm up the trails. Sure you can have fun on winter trails at 20 or 30 degrees fahrenheit, but the really good riding doesn’t start until you get below zero. Minus 10 or minus 20 is even better. The local mtb club got out with their groomer on Saturday just before the overnight temperature dipped into the high teens below zero. Despite very little base, probably 6 inches or less, the grooming timed with the drop in temps created some nice conditions. I headed out late Sunday morning when the temp was still -7F degrees. The trails were firm, but not perfect. A few more snowfalls and a few more groomings are needed to make great conditions. But after the long warm Fall, it was great to be out in the bitter cold riding snow. This is the only picture I took on Sunday before my phone froze and wouldn’t turn on. The bitter cold was brief. By Monday it was warming into the low 20’s again. I wasn’t needed at work and had the day off. I managed get out before it warmed up too much. Even though the temps were in the low 20’s, it had been below zero over night. This second night of bitter cold firmed up the groomed trails even more. The conditions had improved overnight. I had a great day of riding with the Brewer Park and Piedmont trails all to myself. Here’s some of the pictures I took Monday. Today the temps rose to 40F degrees with sunshine. I have to admit the good trail conditions will have disappeared. I will have to wait until another snowstorm and cold temps comes around to get back out on the trails. Note: Internet access issues prevented me from posting this last evening. I also had more to write. But I’m going to post what I have so you all can enjoy it before the week is over. 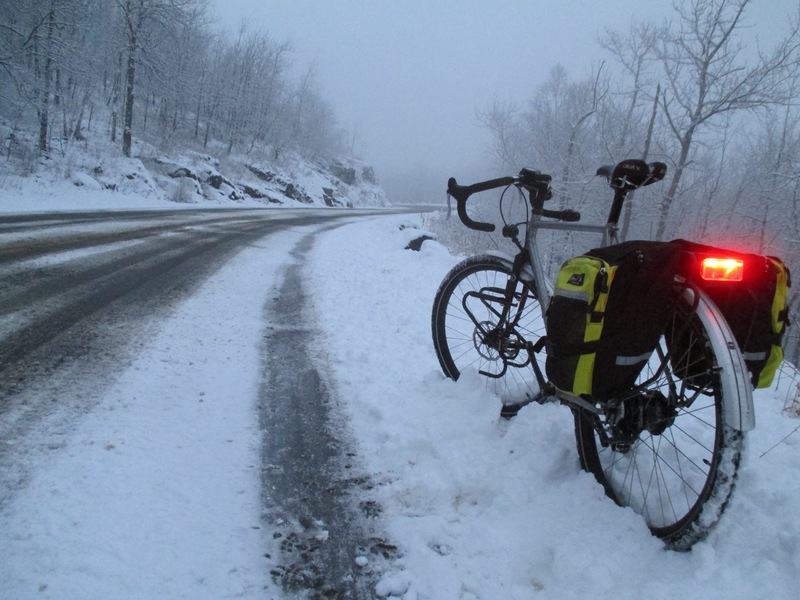 Weekend report: First snowy rides of the season. The same spot one week apart. I look forward to winter. 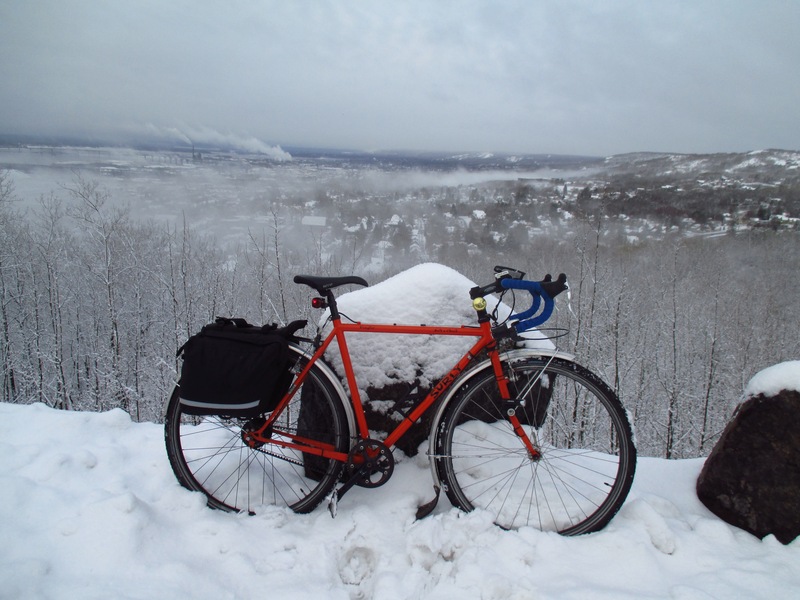 I keep saying the funnest riding I do all year is the riding I do on snow with my Surly Pugsley in snow. I get giddy when the forecast calls for a snow storm. This year we had a very warm November. A very late frost, perhaps a record late frost. The wait for snow has been much longer than normal. But when the weather did change, it was abrupt. The two pictures above were taken from the same spot one week apart. Open water in one, snow covered ice in the other. I’ve been giddy. Saturday we had just enough snow to make it feel like snowbiking. I hit the MTB trails in my neighborhood. The temperature was 10F/12C degrees. That definitely made it feel like winter, finally. There were other fatbikers out on the trails on Saturday as well. I remember when I bought my Pugsley, I rode all winter for 6 years before I saw another fatbike on the local trails I was using. What a change. Sunday we had fresh snow when I woke up and light snow all day. By time I got out on the trails in the afternoon there was a powdery 2″ layer of the fresh stuff. I decided to avoid the MTB specific trails and ride some of the neighborhood multi-use trails. Mostly for a change of scenery from the Saturday ride. Some of these trails are snowmobile trails once there is enough snow. Right now there’s not enough for the snowmobiles to use the trails. To keep this short the rest of this post will be a picture post from my Sunday ride. So good to have the winter season underway. If this would turn out to be a cold winter we could have snow on the ground until April. That’s a lot of snow bike rides to look forward to. Well, being an introvert, and learning to accept that, I’ve learned I’m happier when I don’t seek out large gatherings of people. I’ve become comfortable with going it alone or with a few other people. Throw in the fact I have Celiac Disease and can’t partake in the eating of most common foods and the consumption of beer, there’s not a lot to draw me to groups. So I don’t take much notice to events that are designed to be large social gatherings. Hence my lack of interest in the Global Fat Bike Day. Sure I like fat bikes. I’ve been riding a fat bike longer then 99.9999999% of the current owners of fatbikes. I bought my first fatbike, seen above, in June 2006. Sure I’d love to celebrate these amazing bicycles with others. But then all the above mentioned issues put up all kind of road blocks for me. Not looking for sympathy. Like I said, I’ve become very comfortable going it alone most of the time. It’s so much easier and so much less mentally taxing. Saturday was the appointed day for the celebration of fatbikes. I’m sure there were several local gatherings. But I conveniently had a home project I was working on. Staining our new patio door and trim. I don’t have much experience at staining. So I needed to take my time. Sand, stain, let dry, sand, stain, let dry, sand, clear coat, let dry, sand, clear coat. It’s a time intensive project. No time for bike rides this weekend. 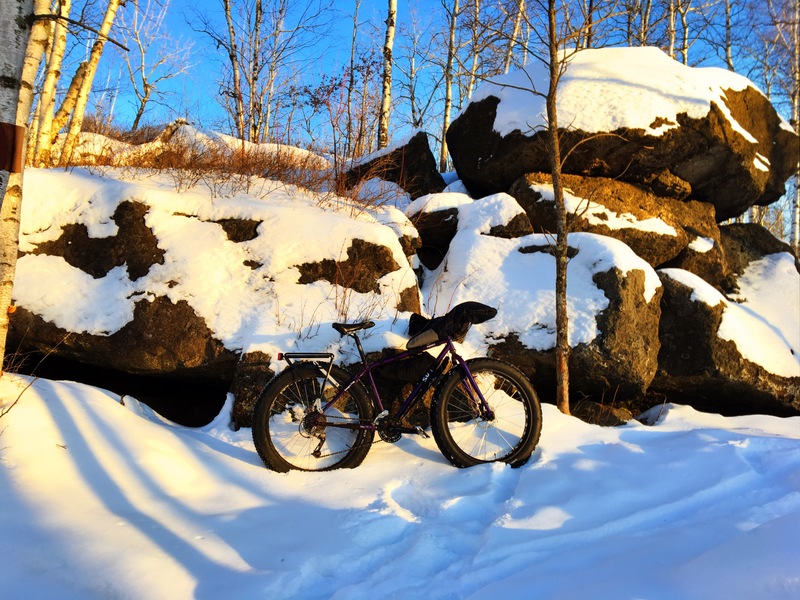 Besides, we’re used to having snow and ice this time of year…you know, fatbike weather. Not only do we not have snow, (enough to ride on) the lakes aren’t even frozen, the ground isn’t frozen yet, and the mountain bikes trails are closed because of muddy conditions. So, what’s the point. By two o’clock I had made good progress on the door and was feeling the need to get outside away from the fumes for awhile. So I figured a quick solo ride on the fatbike and my own little fatbike celebration ride would be suitable. I pieced together a few different trails and paths and abandoned railroads and ended up having a great ride. I knew it’d be dark before I made it home so I brought along lights. It was a wonderful ride. Here’s the route. I decided to ride up the hill to the abandoned DWP rail line and try to reach the tunnel before it got dark. The tunnel is creepy enough in the day time. The above picture is where I picked up the DWP. The DWP used to be a pretty good secret. You’d never see people up here. Only the locals out walking their dogs. But more and more people are finding out about it. In the next year or two it will be improved and added to the local trail network. But for now it still has that abandoned feel to it. The tunnel is eery. Dark and creepy. It’s about 500 feet in length and goes under Ely’s Peak. It curves slightly so you can’t see the other side until you are about halfway through. A big chunk of the ceiling has fallen and is partially blocking the path through the tunnel. As I was taking a photo of the tunnel another fatbiker arrived. He didn’t even slow down and mumbled something about not being the only one out here. He entered the tunnel and quickly disappeared, as if the darkness of the tunnel swallowed him up. You can see the light of his head lamp lighting up the tunnel in the above picture. It should be very cool when they open this trail to the public. They have some work ahead. Some wash outs and a major chunk of the hillside has slid down onto the trail above. Almost completely blocking the trail. 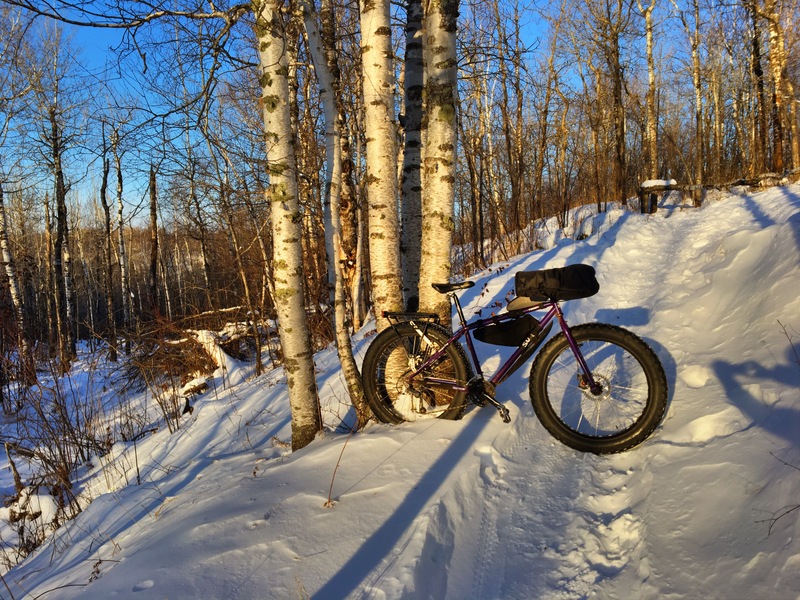 In the end I think my Global Fat Bike Day 2016 solo ride was a smashing success. My on-line store, Salty Pedaler, has quite a few new products. Available for purchase are bicycle related designs applied to tee-shirts and mugs. I come up with designs I like and also offer them to others. Recently a friend of mine told me he liked one of my designs and decided he’d like to buy a tee shirt with the design on it. I was excited to know what design he liked so much. Turns out he liked the Salty Pedaler logo design the most. I told him it wasn’t offered on any of my products. He was insistent it was the logo he wanted on a tee shirt. I ended up ordering a sample order with two tee shirts and a mug. One for him and one for me in a different color, just to see how it came out. It ended up looking great on a tee shirt and the mug. It looked so good I put it on the Salty Pedaler website. In the past few weeks it’s been one of my better sellers. They are offered in men’s tees and unisex tees. Check out all the products at Salty Pedaler.